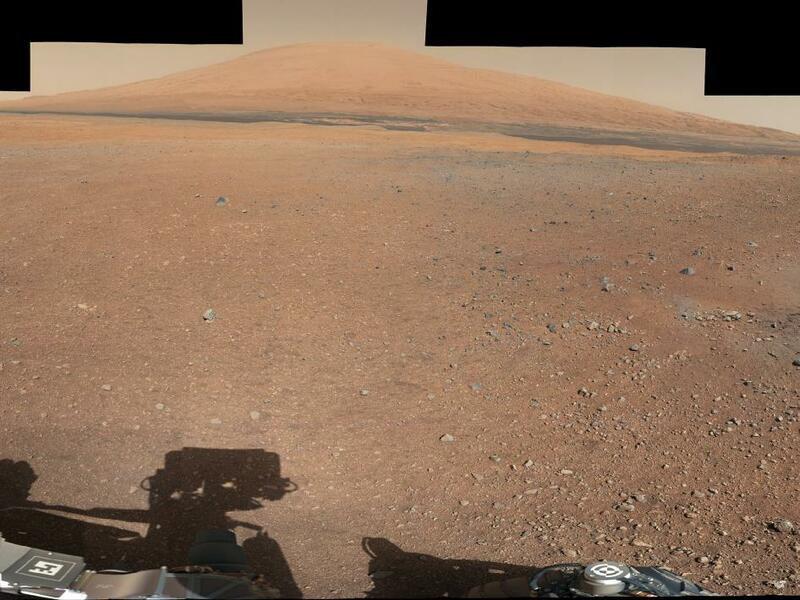 This color panorama shows a 360-degree view of the landing site of NASA’s Curiosity rover, including the highest part of Mount Sharp visible to the rover. 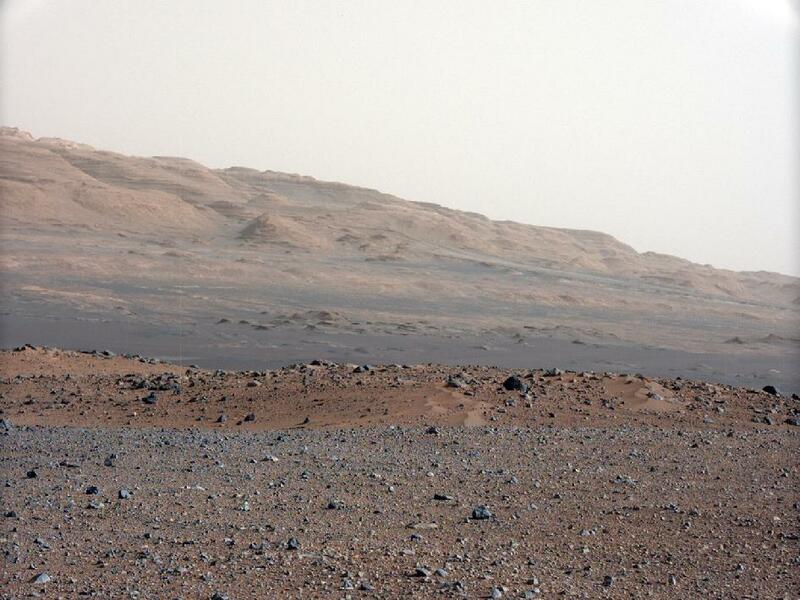 That part of Mount Sharp is approximately 12 miles (20 kilometers) away from the rover. 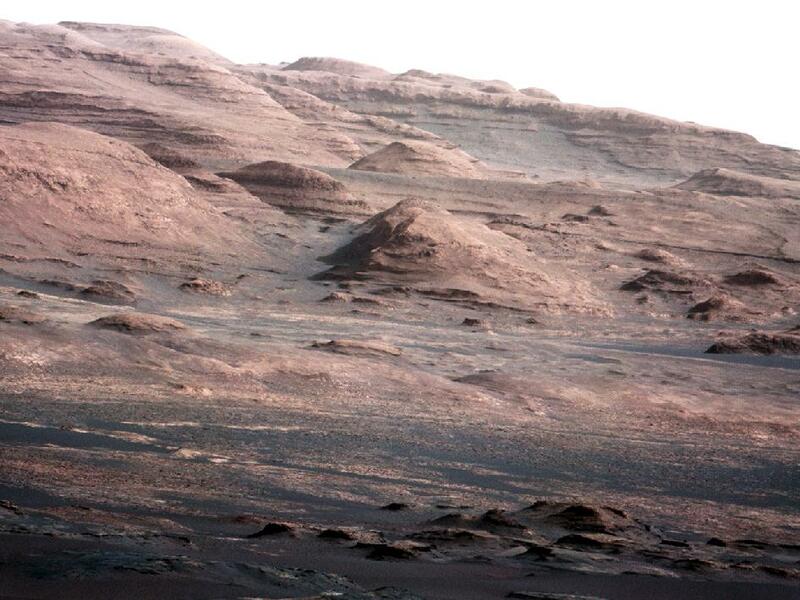 This image is from a series of test images to calibrate the 34-millimeter Mast Camera on NASA’s Curiosity rover. It was taken on Aug. 23, 2012 and looks south-southwest from the rover’s landing site. The gravelly area around Curiosity’s landing site is visible in the foreground. Farther away, about a third of the way up from the bottom of the image, the terrain falls off into a depression (a swale). Beyond the swale, in the middle of the image, is the boulder-strewn, red-brown rim of a moderately-sized impact crater. Father off in the distance, there are dark dunes and then the layered rock at the base of Mount Sharp. Some haze obscures the view, but the top ridge, depicted in this image, is 10 miles (16.2 kilometers) away. A chapter of the layered geological history of Mars is laid bare in this postcard from NASA’s Curiosity rover. The image shows the base of Mount Sharp, the rover’s eventual science destination. This image is a portion of a larger image taken by Curiosity’s 100-millimeter Mast Camera on Aug. 23, 2012. See PIA16104. Scientists enhanced the color in one version to show the Martian scene under the lighting conditions we have on Earth, which helps in analyzing the terrain.